STAN SOCHANEK TEACHING JUDO IN THE GRAND RAPIDS AREA FOR OVER FORTY YEARS!!!! Since the end of World War Two, Judo has gained popularity in the United States. Many service men were exposed to Judo either in their military training or during their tour of duty in Japan. Contrary to popular belief, Judo is not merely a form of self-defense (although it may be applied as such) but it is recognized as an amateur competitive sport and has been part of the Olympic games since 1964. 1. Because it makes one's body strong. 2. Because it is interesting as a sport. 3. Because it is of use in self-defense. 4. Because it is helpful to mental development. Men and women find that Judo is an excellent way to improve balance and cordination. It is also a wonderful challenge. Judo should appeal to every young child eager to make themselves healthy, strong, skillful and able to defend themselves against a bully. An elementary knowledge of Judo makes a young child confident and self-reliant for the life ahead of them. Judo is practiced on a mat. The students (judoka) wear a suit called a judogi.This suit consists of loose fitting cotton trousers and a stongly woven cotton jacket. Shoes are never worn on the mat. Special emphasis is placed on cleanliness by all judokas. The judo gi should be kept clean. Finger and toe nails should be kept short. A course of instruction begins at the fundamental level of how to fall properly. No actual contest is introtuced until this skill has been mastered. The importance of falling cannot be understated since it is an essential part of remaining injury free. Since Judo is a contact sport, the question of injury often arises. Judo requires skill and judgement and if these two requisites are kept in mind when persons are allowed to participate, injuries will be kept to a minimum. After the initial 3 month course is completed, those wishing to continue on in the advanced course and strive to gain promotion in the ranks established by the Kodokan in Japan. Grading in Judo is based on one's ability, technique, knowledge of the sport, attitude, and results in competition. The beginner wears a white belt(6th kyu). After successful practice and study promotion is to 5th and 4th kyu >(green and blue belts). After that are three degrees of brown belt (3rd, 2nd, and 1st kyu). A junior competitor also starts with a white belt. The succeeding ranks are Yellow, Orange, Green, Blue, and Purple. After the judoka has advanced to the rank of 1st ikyu they are ready to try for the most sought after rank which is the Black Belt. There are 10 degrees of Black Belt. The highest rank of Black Belt in this country is eigth degree. Skill in Judo is simply a combination of basic knowledge, speed, timing, balance, and coordination. It is neither magic or trickery but it is a means by which the weak may defeat the strong. It is a sport in which young, old, male, and female may take part. The United States is improving on the international level as evidenced by winning a bronze medal in the 156 pound class in the 1996 Olympics. 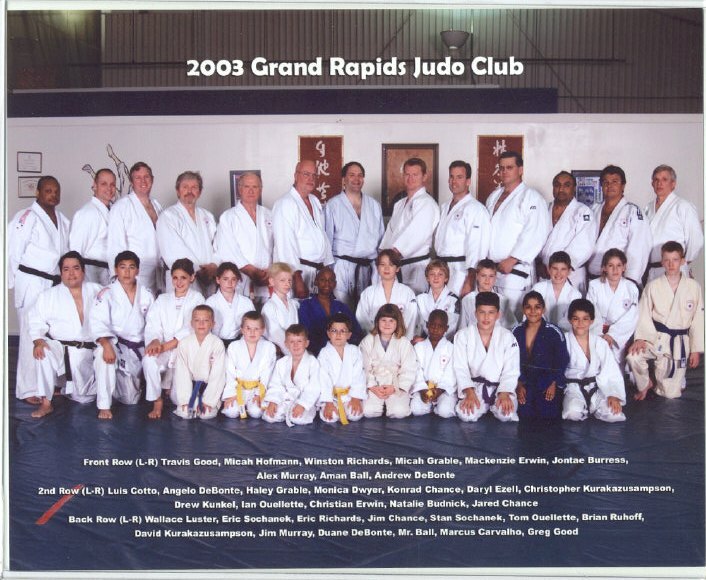 Stan has been teaching Judo in the Grand Rapids area since 1958.He received his first Judo training and Black Belt in 1955. He is an international competitor having competed in Japan, Germany, and the United States. In 1960 he was YMCA State Champion. In 1961 he was AAU State Champion. He was a member of the U.S. Team that competed against Canada in June 1963. Stan is past chairman of the Life Membership Committee for the United States Judo Federation and currently a Vice-President for the Konan Yudanshakai, the midwest section of the national organization. He was promoted to the rank of Rokudan (Black Belt 6th Degree) in 1998 and has been at East Hills since 1987.